Audrey Hepburn’s engagement ring is one of the most famous – or should we say, her engagement rings are among the world’s most famous! When she and actor Mel Ferrer tied the knot in 1954, she was presented with three rings rather than one. Meant to be stacked or worn separately to complement different outfits, they were crafted of rose gold, yellow gold, and white gold. These rings were much smaller than most of the celebrity engagement rings of today. Like Audrey Hepburn’s engagement rings, this trio of beautiful rings from Brilliance is meant to be worn together or stacked. 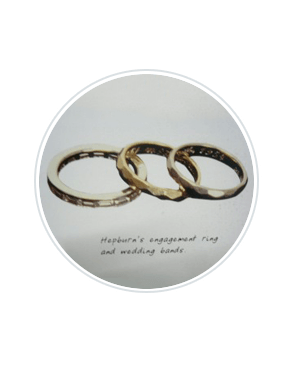 They offer a fun take on the traditional engagement ring, allowing the wearer to enjoy a variety of options – and they come with a fun story. Born May 4th of 1929 in Ixelles, Brussels, Belgium, Audrey Hepburn is perhaps best known for starring role in the film Breakfast at Tiffany’s. She died on January 20th of 1993 and is buried at Tolochenaz Cemetery in Tolochenaz, Vaud, Switzerland. Hepburn spent her childhood between England, Brussels, and the Netherlands, surviving World War II, and moving to London in 1948, where she studied ballet. She performed as a chorus girl in a number of West End theatre productions, and spoke numerous languages including French, Dutch, Spanish, Italian, German, and of course, English. She starred in several films throughout a career that spanned nearly fifty years, after which she devoted the majority of her time to philanthropic efforts and creating a special relationship with UNICEF. Audrey Hepburn was awarded the Presidential Medal of Freedom in December of 1992, just a month before her death at the age of 63. Did you know that Audrey Hepburn holds a place in the International Best Dressed List Hall of Fame? She is also regarded as among the most naturally beautiful women of all time, and she is ranked by the American Film Institute as the third greatest female screen legend in the history of American cinema. What Our Experts Have to Say about Audrey Hepburn’s Engagement Ring. Audrey Hepburn’s engagement rings were inspired by love – just like the celebrity engagement rings we love to take inspiration from today. Not at all overbearing, and intended to complement her entire wardrobe without detracting from her delicate beauty, they offer a look into vintage style at its best. There are many ways in which one could take inspiration from this trio of marvelous, historic engagement rings. Celebrity engagement rings are almost always expensive, but Audrey Hepburn’s engagement ring trio is an exception. We are not certain how much they cost when initially purchased, however they would almost certainly fall into the “affordable” category by today’s standards. Whether you’d like exact replicas of Audrey Hepburn’s famous engagement rings or if you’d simply love to use them as inspiration, you can use the simple online tools available at Brilliance to create a set of stackable rings of your own, giving a nod to one of the most beautiful actresses of all time while allowing your own style to shine through. Let the diamond experts at Brilliance help you to create a look that represents your love while adding sparkle to your life.